Rep. Karen Boback (above, left) attended the July meeting of the Blue Star Mothers of NEPA on Tuesday evening, which was held at the Yearbook Diner in Tunkhannock and read a proclamation to the group with chapter president (standing, right) Lori Bishop looking on. 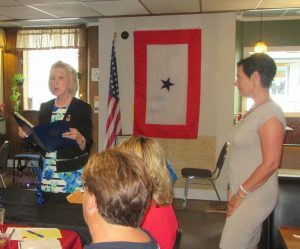 The Blue Star Mothers NEPA Chapter received their official charter on July 18. 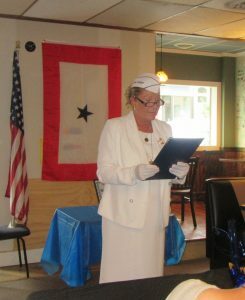 Blue Star Mothers national president Cynthia Ventura (below) presented the group, formed in late April, their official charter on Tuesday evening. They will henceforth be known as Chapter PA 14. Chaplain for the ceremony that preceded the regular meeting of the group was Christine Evans, and Sara Shaffer-Greene served as captain. Officers installed included Lori Bishop as president, Crystal Bernosky as vice president, Colleen Ell as recording secretary, Krista Dymond as financial secretary, and Sandy Frisco as treasurer. Mothers, stepmothers, grandmothers, foster mothers and female legal guardians in more than 200 chapters across the nation support each other and their children as part of this non-political, non-partisan, non-sectarian effort. Among the projects they pursue are the coordination of care packages and letters to members of the Armed Forces and hosting events for Gold Star Mothers and families, those who have lost sons and daughters in conflicts around the world. Chapter PA 14 officially serves Bradford, Sullivan, Susquehanna, Wyoming, Luzerne and Lackawanna counties. Mothers from adjacent counties are welcome to participate in the monthly meetings held on each third Wednesday. (The date was adjusted this month to accommodate Ventura’s schedule). For more information, call 570-430-9997 or email bluestarmothersnepa@gmail.com.